Obituary for Gemma H. Johnson | Rhoney Funeral Home, Inc.
Gemma H. Johnson, of Niagara Falls, NY, passed away on Saturday, August 25, 2018, in Brookdale Niagara, Town of Wheatfield, NY. She was born in Manhattan, NY on September 3, 1924, a daughter of the late Pietro and Teresa [Gardella] Lorenzetti. Mrs. Johnson graduated from Washington Irving High School and attended Juilliard School of Music. During World War II, she was an Italian examiner and translator in the Office of Censorship reviewing POW Letters. From 1945 to 1951 she was a secretary for the Army Transportation Corp at the NY Post of Embarkation where she met her husband. She moved to Niagara Falls, NY in 1968 and became an administrative assistant at New York State Power Authority in Lewiston, from 1971 until retiring in 1992. Mrs. Johnson enjoyed music, especially opera and Nelson Eddy. 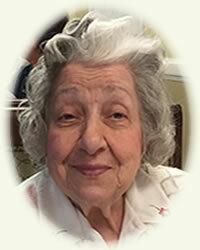 She was a member of the Nelson Eddy Appreciation Society and enjoyed crossword puzzles and spending time playing Scrabble and cards with her family, grandchildren and great grandchildren. She was the wife of the late Edward A. Johnson, Sr., who passed away in June of 1979. Mrs. Johnson is survived by her eight children Teresa (John) McDermott, Edward (Barbara), Paul (Tracy), Philip (Joanne), Rosaire, Thomas (Doris), Patrick and Gregory (Trisha) Johnson, 17 grandchildren, 8 great grandchildren, nieces and nephews. She was the sister of the late Rev. Giuseepi (Fr. Joseph), Angelo (Madeline) Lorenzetti, Amabile "Mabel" (Armand) Balboni, Rachele, Alexander (Louise) Lorenzetti, Helen (John) Dellolio, Albert Lorenzetti and Agnes (George) Segalini. Her family will be present on Monday from 3-8 PM at the RHONEY FUNERAL HOME, 901 Cayuga Street, LEWISTON, NY, where funeral services will be held on Tuesday at 9:15 AM, followed by a Mass of Christian Burial at 10:00 AM at St. Raphael Parish, 3840 Macklem Avenue, Niagara Falls, NY, with Rev. Ivan Skenderovic officiating. Flowers are gratefully declined. Memorials may be made in her name to the Our Lady of Fatima Shrine, 1023 Swann Road, Lewiston, NY 14092.